That hand pays the Bad Beat Jackpot! SwC Poker launched our BBJ promotion without taking any extra rake - we simply donate 20% of each drop on BBJ tables to the BBJ jackpot fund. We think it adds some extra excitement to the game. In historic fashion, the first time it was hit on Bitcoin Poker 3.0 was 1/1/2019. On hand #2,557,989 Dapokerzombi lost the with pocket tens, making AAATT to claim the winning share of the first ever SwC Poker Bad Beat Jackpot for 178,042.51 chips! 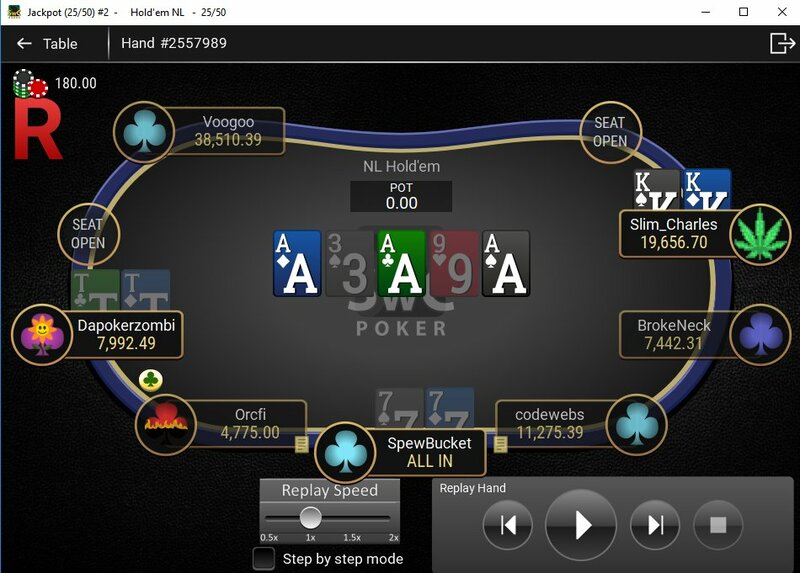 Slim_Charles won the hand with AAAKK and took home the pot plus an additional 101,738.58 chips! 6 other players won 12,717.32 chips for being dealt in the hand. Congratulations to the first ever BBJ winners on Bitcoin Poker 3.0!